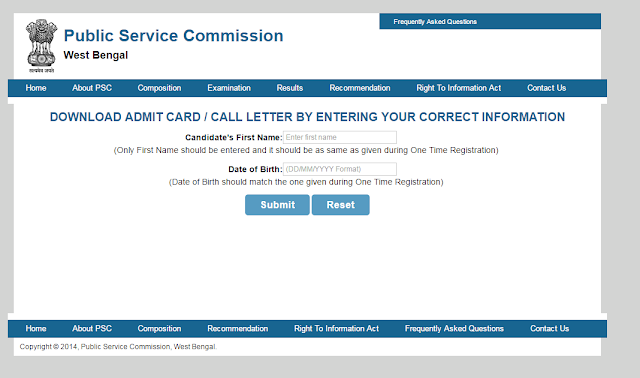 WBCS Admit Card 2018 (www.pscwbonline.gov.in) – Download Here Call Letter for West Bengal Civil Services Admit Card for Prelims examination now. WBPSC Released the WBCS Online Admit Card 2018 for preliminary examination. The Aspirants Preparing for Civil services Prelims exam can download West Bengal Civil Services Call letter, hall tickets for Prelims exam. The WBCS Prelims exam is scheddule to be held on January 28, 2018, and the admit card issued on January 12, 2018. The WBCS PRelims Exam admit card has been issued online also and the offline copy of it is not being dispatched till date.